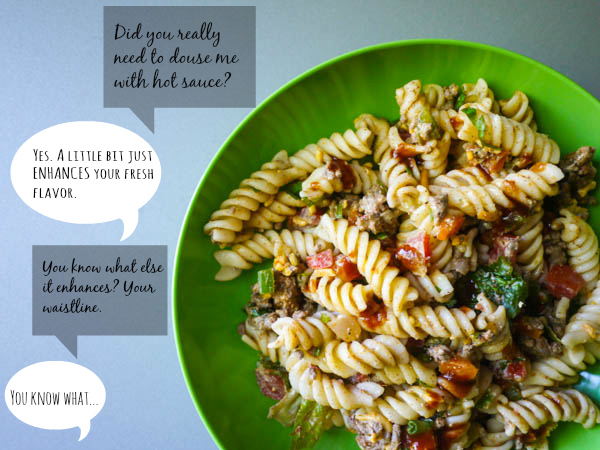 This recipe is slightly adapted from Dan of Food in my Beard’s Leftovers Pasta Salad, one of my favorite bloggers. (He actually has a book out called Stuffed: The Ultimate Comfort Food Cookbook that is really unique, just like his blog.) 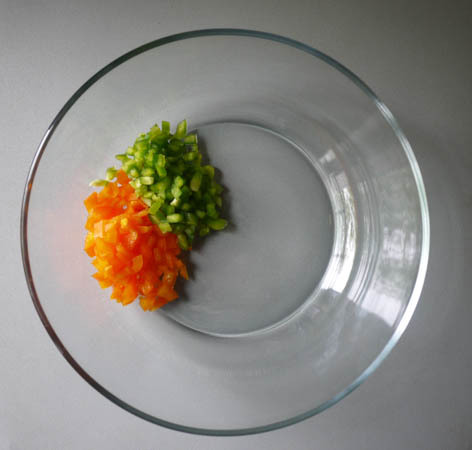 I came across his blog a long time ago while looking at recipes for making fresh pasta. I always thought I should wait to make fresh pasta until I had the perfect kitchen with tons of space and all the fancy gadgets. Then I saw Dan (actually Mandi) making pasta on a small coffee table, with pasta sheets drying all over the bed, and I realized that I needed to seize the day! No need to wait for a fancy kitchen! We made fresh pasta that very day. 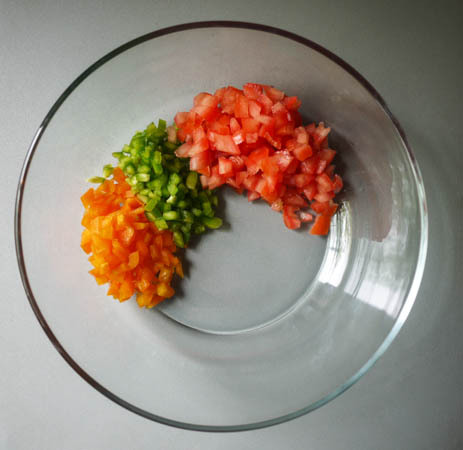 He is my adventurous food hero and I’m inspired by all the unusual flavor combinations he puts together. 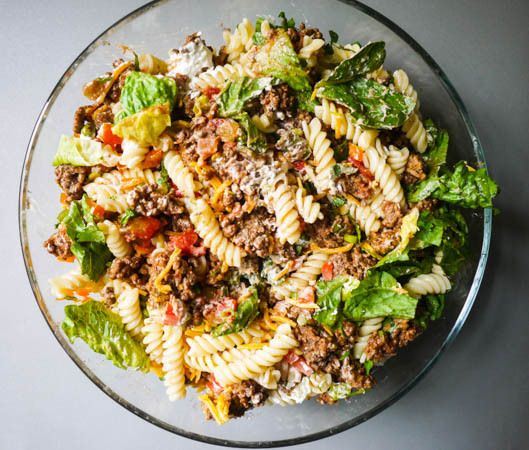 The best way to describe this pasta salad is BRIGHT. 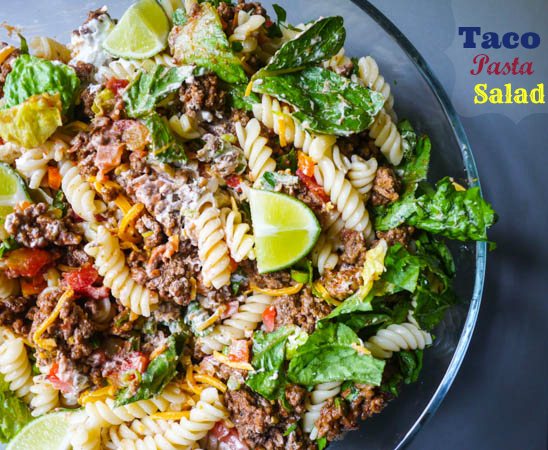 There are a lot of taco pasta salads out there that use mayo or bottled dressings to bring it all together and this one doesn’t have any of that. 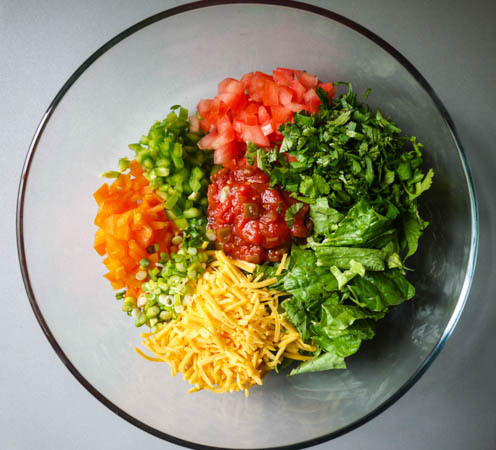 You really get to taste the flavors of the fresh ingredients. 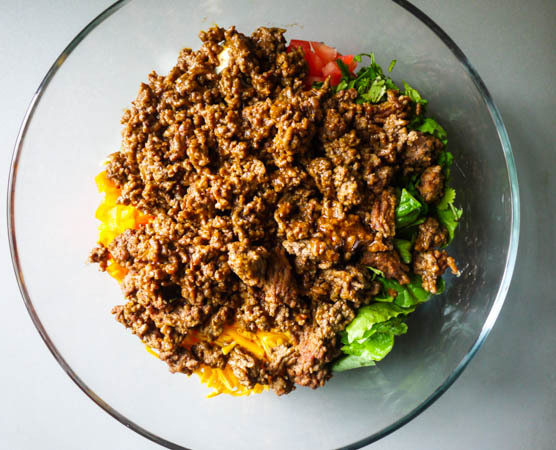 Either use leftover taco meat or brown 1 lb of ground beef, drain the oil, and add taco seasoning. Let this mixture cool completely. You REALLY need to wait for it to cool completely, otherwise the cheese and lettuce we are mixing it with will immediately melt and wilt. It’s also really important that you drain the beef before adding your seasonings. Cold oil looks and tastes terrible and you will ruin the salad. 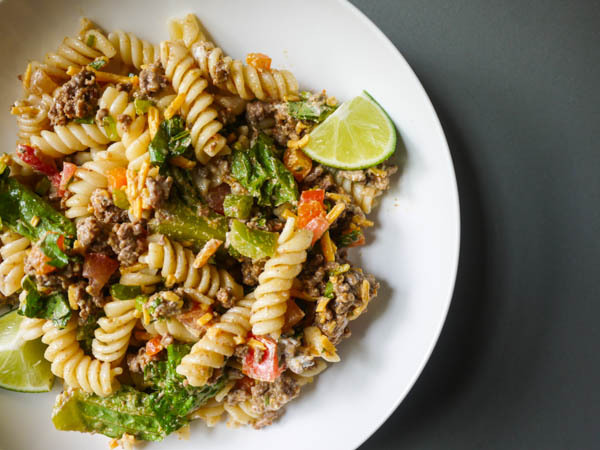 By this time, your taco meat should be cool if you made it fresh. 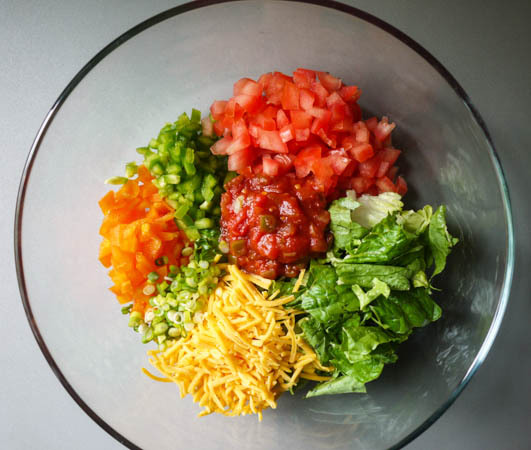 Add it to the other ingredients in the bowl. 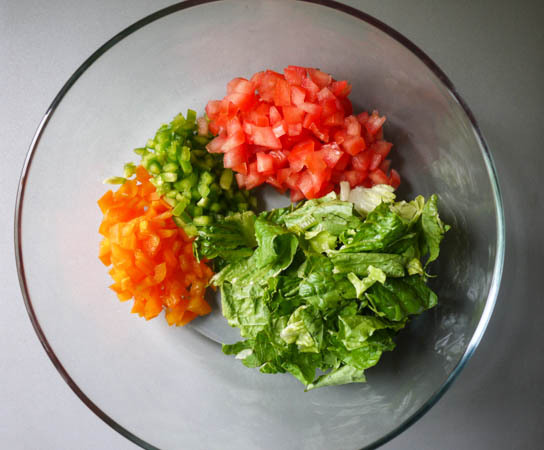 If you want to keep this low carb, you can stop right here and mix everything together. It is wicked good! If not, proceed by boiling water and cooking your fusilli noodles. Drain and rinse them under cold water until they are cool. I know Italian grandmothers everywhere are probably turning in their graves over that last statement about rinsing pasta, but it helps to cool the pasta down quickly so you can mix it with the other ingredients and get your grub on. and give everything a nice mix. On the second day, I warm it up slightly (about 30 seconds in the microwave) to take the chill on the beef down a notch. It’s super good with jalapeno tabasco. Or chipotle tabasco. Or both, lol (pictured below)! 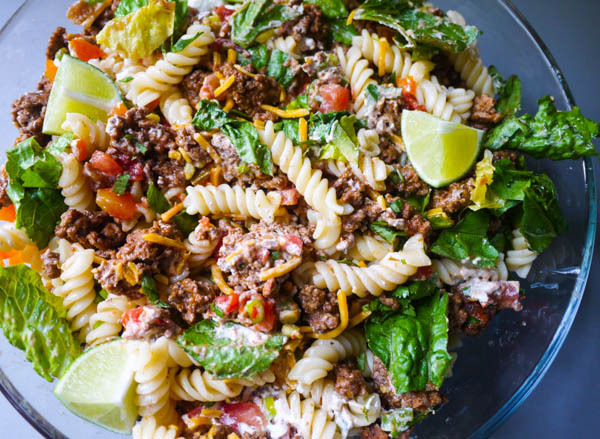 Refreshing pasta salad with bright, Mexican flavors. Either use leftover taco meat or brown 1 lb of ground beef, drain the oil, and add taco seasoning. Let this mixture cool completely. 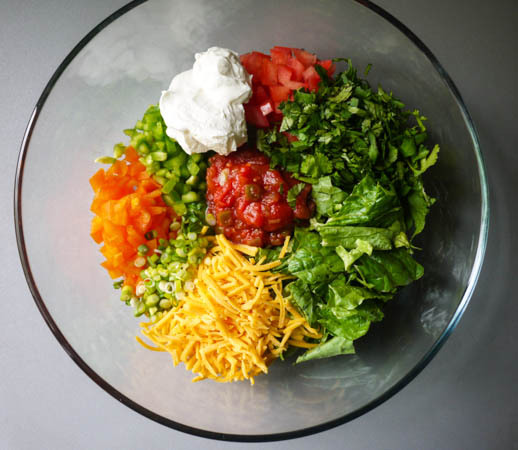 In a large bowl, combine bell peppers, tomato, romaine lettuce, cheddar cheese, chunky salsa, scallion, cilantro, and sour cream. 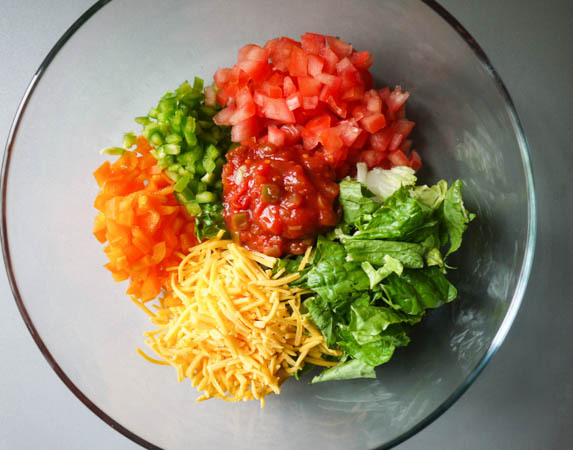 Add your taco meat to the bowl. 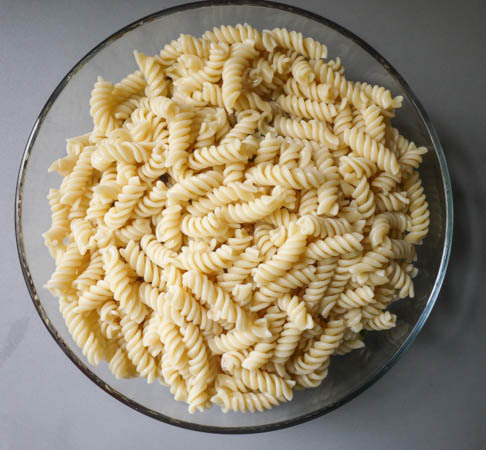 Fill a large pot with water and cook your fusilli noodles. Drain and rinse your noodles under cold water until they are cool. Add the cooled pasta to the other ingredients in the bowl. 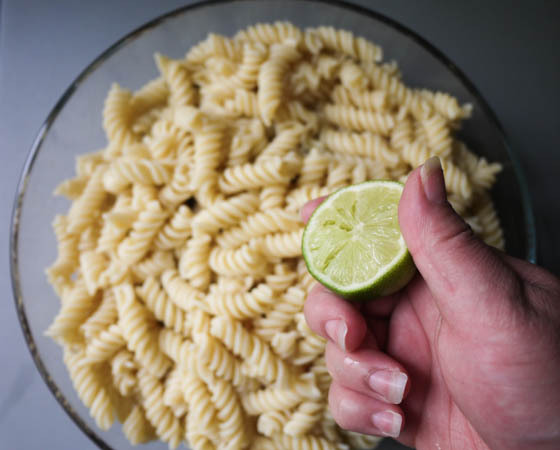 Squeeze a lime on top of the pasta. What a fantastic summer dish! The colors are bold and rich. I could eat it right now for dinner. Please add this to the list of delicious meals you are going to prepare for us when we visit. Great presentation! Wow I just saw this! Thanks so much for the kind words. 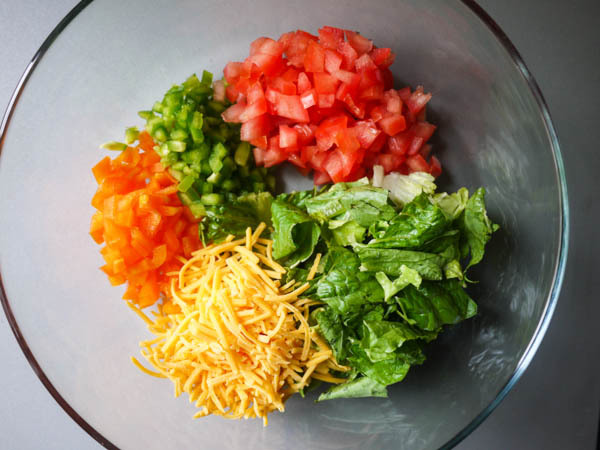 The salad looks amazing!